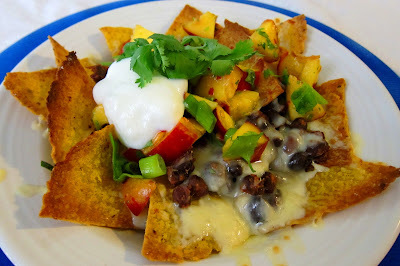 When I was young, nachos meant a big pile of greasy tortilla chips with fake oozy cheese that probably came from a bag...and I actually liked when they served them for lunch in Elementary school! But now that I am not into fake food, and I try and eat healthfully (but tastefully), I decided that I would like a delicious version of nachos that I can feel good about eating! It had to contain some protein as well as some produce though in addition to the cheese, or it would not be a meal in my opinion! So, I came up with a bean mixture to top my chips with that contained spiced black beans as well as a bit of fresh ingredients such as cilantro and lime. I also made a home made salsa using nectarines, since I did not have any tomatoes in my kitchen...plus I enjoy fruit salsas more than tomato based ones. I do not have any chips in my house, but I do have sprouted grain corn tortillas! So, I made my own chips in the oven, which turned out to be very tasty! But if you were making this and you had chips on hand by all means you could use them! I used chihuahua cheese for my melting cheese, because I happened to have some in my cheese drawer...and was it delicious! Ooey gooey...a far cry from the nasty bagged nacho cheese of my childhood, which I couldn't be happier about! I topped off the mound of nachos with a bit of low fat sour cream and some cilantro, and voila! Nachos fit for a queen! If you are a fan of nachos, but you want to feel good about eating them as well as enjoy them...try these for a quick dinner! I know they are nothing like the ones you ate in Elementry school lunch, but trust me, these are way better! Preheat the oven to 450 degrees. Line a baking sheet with foil, and spray with coconut oil spray. scatter chips on sheet and spray with oil, then sprinkle with sea salt (on both sides). Bake until crispy and golden, about 10 minutes. Remove from oven and increase oven heat to 500. Meanwhile, heat a medium non-stick skillet to medium heat, add 1 Tbsp coconut oil, and onions and saute until onions are translucent, about 5 minutes. Add garlic, chili powder, cumin, and chipotle, and saute for ine minute until fragrant. Add the beans, and cook until heated through, then add the cilantro, lime juice and sea salt to taste. Set aside and keep warm. To make salsa, combine all ingredients in a bowl and mix well. To assemble, divide the chips evenly between 2 plates. Top each with bean mixture, then the cheese. Place in the oven, and bake until cheese is bubbling, about 2-3 minutes depending on your oven. Keep an eye on it, because it could quickly burn at such a high heat. Remove from oven, and top each with salsa, and a bit of cilantro and sour cream if desired. 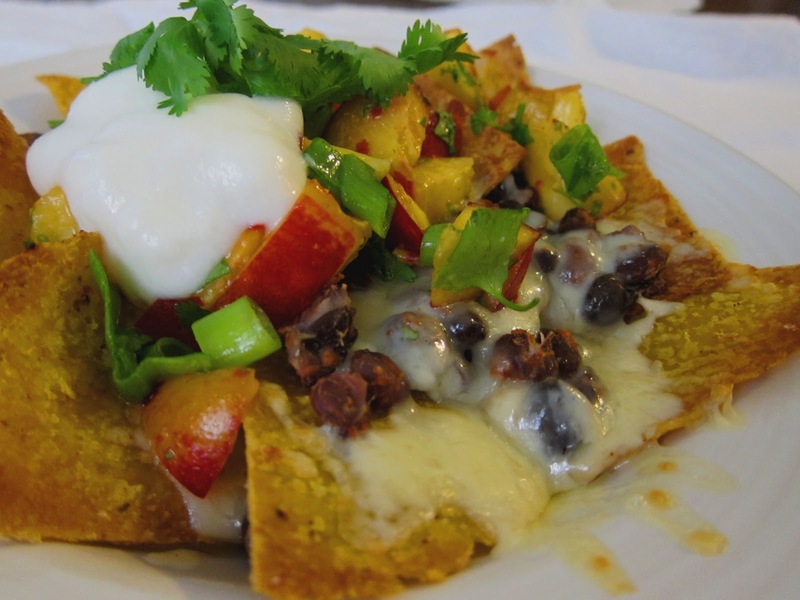 These nachos look so yummy, I love the combination of flavors you used together. Vanilla gal ...this looks so mouth-watering! oooh i have tons of peaches i've been looking to use. i know what i'm making.